People who admitted using marijuana were found to have lower blood glucose levels and were less likely to be insulin resistant, according to the National Health and Nutrition Survey. WEDNESDAY, May 15, 2013 — Smoking marijuana — even if the ensuing junk-food binge can’t be avoided — may mean you're less likely to develop type 2 diabetes, according to research published in The American Journal of Medicine. Fasting insulin and glucose data from 4,657 National Health and Nutrition Survey participants revealed that "current users" of marijuana were part of the least likely demographic to have common risk factors for diabetes. Marijuana smokers who admitted to being “current users” — not previous users — had the lowest fasting insulin and glucose levels and body mass index. High fasting insulin levels are considered evidence of insulin resistance — the inability of the body to respond properly to insulin - a risk factor for pre-diabetes. Pre-diabetes is also suspected when a person has high blood glucose levels, and marijuana smokers had an average glucose level of 99.7 milligrams per decilitier compared to 103.5 mg/dl for people who claimed to have never used the illicit drug. A normal blood sugar range is generally between 70 and 100 mg/dl, but can fluctuate based on meals eaten throughout the day. "Previous epidemiologic studies have found lower prevalence rates of obesity and diabetes mellitus in marijuana users compared to people who have never used marijuana, suggesting a relationship between cannabinoids and peripheral metabolic processes, but ours is the first study to investigate the relationship between marijuana use and fasting insulin, glucose, and insulin resistance," stated lead investigator Murray A. Mittleman, MD, DrPH, of the Cardiovascular Epidemiology Research Unit at the Beth Israel Deaconess Medical Center in Boston, in a press release. Despite the common stereotype of marijuana users craving high-calorie food and lots of it — "the munchies" — pot use was also linked to having a lower body mass index in the study, another factor not often associated with diabetes. With the recent increase in marijuana legalization, the Boston researchers believe it's important for physicians to understand the effects of smoking pot on conditions like diabetes, and they suggest future research should on the links between marijuana use and other common conditions. 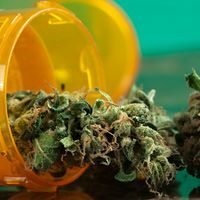 "We desperately need a great deal more basic and clinical research into the short- and long-term effects of marijuana in a variety of clinical settings such as cancer, diabetes, and frailty of the elderly," said Joseph S. Alpert, MD, Professor of Medicine at the University of Arizona College of Medicine, Tucson, in the press release. The new data does not explain why marijuana may be linked to lower instances of these diabetes risk factors. Rather, the analysis simply found that pot smokers were less likely to show early signs of the condition. “We have patients that use marijuana illegally, and it does not seem to have any positive or negative effect on blood sugar,” said Amber Taylor, MD, Director of the Diabetes Center at Mercy Medical in Baltimore, Maryland. There is also the possibility that the new data says more about the type of people using marijuana — primarily young skinny males — than it does about the preventive associations between marijuana and diabetes. When it comes to medical use, marijuana has been found to relieve pain, improve mood, and increase appetite. In addition to the latest diabetes findings, marijuana use has also been shown to reduce the spasticity caused by multiple sclerosis. The drug is also believed to have components that actually reduce appetite and boost metabolism, which can prevent obesity. But the news isn’t all groovy when it comes to grass. Although some parts of pot might help you avoid obesity, researchers have also found a link between drug use and binge eating - the munchies again. “With any sort of illicit drugs, it decreases your inhibitions and leads to snacking and eating that increases your blood sugar,” said Dr. Taylor. Smoking doobies might also be connected to unusual digestive problems, heart trouble, and lower IQs. Even if you're using marijuana for medicinal purposes, further monitoring is a good idea, said Taylor. Thanks Kittypup, The most encouraging thing is that the mainstream media is finally getting the word out. People need to see this!